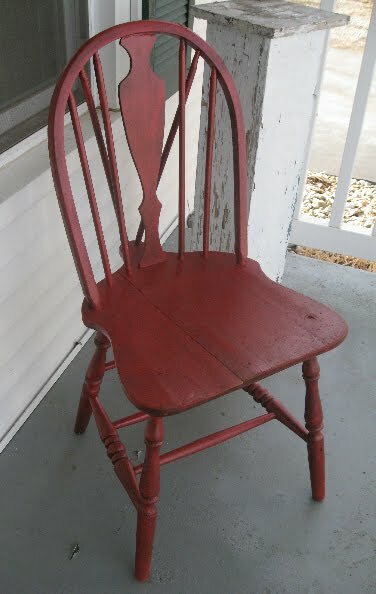 Isn't an old red chair just a charming little greeting on a front porch? I happen to think so. 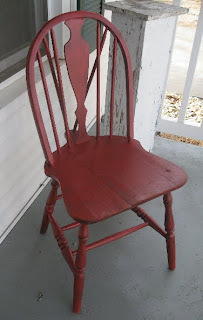 And the good thing about it is, you can paint an old wood chair rather haphazardly since it's supposed to have that weathered look, and you have a quick and cute sittin' spot. Or better yet, put a big pot of flowers on the seat for a chic country look. Me and potted flowers don't go well together since you actually have to water them. Every day. This barstool took a few coats of spray paint. Man I have such a love/hate relationship with spray paint. The part of me that lives by "waste not, want not" has a really hard time with all the over spray. The slightest breeze and nooooooo come back here paint - and it it disappears into thin air. you can buy that webbing on ebay and redo them- then all you need is some cute cushions.